One of the struggles I faced after sustaining my Traumatic Brain Injury (TBI) was difficulty focusing. Apparently this isn’t a problem only those who have sustained a TBI face, but also impacts many non-TBI survivors. The world around us is not helping with this struggle. I observe people bouncing around between the apps on their phones, checking their emails, Twitter, Snapchat, and Facebook, texting, all while working or socializing with friends and families. These are not just annoying habits – it’s a little more insidious than that – these habits are denigrating our ability to focus. Georgetown professor Cal Newport explains that too much bouncing around doing different tasks degrades our ability to concentrate when we need to. People who do a lot of attention switching, they believe they can focus when they need to, but the reality is they have lost that ability. When you give them a task that requires focus, they perform worse than people that don’t spend a lot of time fragmenting their attention. According to Professor Newport, focus is a skill that has to be trained. You can’t just decide, “Now I’m going to go focus intensely for the next three hours on something.” If you haven’t built up your capability to do that, you’re going to have a very hard time. Bouncing around on your apps, checking your email, texting all at the same time has an impact on your ability to focus when dedicated focus is needed. Much like lifting weights at the gym, the more time you spend doing it, the stronger you’ll become. And if you haven’t been spending much time focusing, it can take a little while to get that skill back up to speed. So to be more focused you need to spend more time focusing. But how do we build up our focus muscle? You want to focus but you’re worried about all the other things you have to do. So we often decide to work on multiple tasks at the same time. While writing this article, I’m also thinking about the bills I have to pay, getting my income taxes done, what I’m going to make for dinner, etc. I am tempted to go online to pay some of those bills, look up some recipes, and plan my shopping list. I may feel like I’m getting a lot accomplished, but focusing on these other tasks is taking me away from the task at hand and making it harder to complete. Research suggests that when I switch from writing this post to going online to pay my bills, and back to writing, my attention doesn’t immediately follow—a residue of my attention remains stuck thinking about the bills I just paid – did I pay them from the right account, did I get the date right? When I am thinking about these other tasks it reduces the amount of mental firepower I have to devote to writing this article. One approach to combating “residual attention” is to get the concerns about all the other tasks out of my head by writing them down. Neuroscientist Daniel J. Levitin explains that writing things down deactivates “rehearsal loops” in my brain. When we have something on our minds that is important, such as a to-do item, we’re afraid we’ll forget it. Our brain rehearses it, tossing it around and around in circles in what cognitive psychologists actually refer to as the rehearsal loop, a network of brain regions that ties together the frontal cortex just behind your eyeballs and the hippocampus in the center of your brain. The problem is that it works too well, keeping items in rehearsal until we attend to them. Writing them down gives both implicit and explicit permission to the rehearsal loop to let them go, to relax its neural circuits so that we can focus on something else. Having a plan for how I’ll take care of these other tasks also helps. Apparently, committing to a plan to complete my incomplete tasks can help me to complete the task of finishing this article. Another neat strategy that I learned from my occupational therapist is to set aside a specific chunk of time to work on the task at hand. My limit for focused attention is an hour. So, I set the timer on my phone for an hour. When the time is up, I will stop working on this post, and consult my recipe collection to plan dinner. We’ve all heard this adage when it comes to real estate – but it is also important when it comes to focusing. Focus is a function, first and foremost, of limiting the number of options you give yourself for procrastinating… I think that focus is thought of as this magical ability. It’s not a magical ability. It’s putting yourself in a padded room, with the problem that you need to work on, and shut the door. That’s it. The degree to which you can replicate that, and systematize it, is the extent to which you will have focus. …top performers overwhelmingly worked for companies that gave their workers the most privacy, personal space, control over their physical environments, and freedom from interruption. One of the most powerful ways to improve your ability to focus is to pick the right environment. After my daughter moved out, I converted her bedroom into a den. I painted the room a beautiful grey-green, bought a lovely glass desk, brought in a comfy chair from another part of the house, and hung some of my favourite art work. This is where I go when I want to focus. Turn smartphone notifications off. Your computer should not be chiming when you get a new email. You need to stop being in a mode where you are reacting to things. This leads to attention residue, as discussed above; anytime you are reacting to new stimuli it pulls you out of focus. The new stimulus can linger in your head, draining your ability to concentrate on what’s important. It might seem harmless to take a quick glance at your inbox every ten minutes or so. But that quick check introduces a new target for your attention. Even worse, by seeing messages that you cannot deal with at the moment (which is almost always the case), you’ll be forced to turn back to the primary task with a secondary task left unfinished. The state that almost every knowledge worker spends their day in is a terrible state if your goal is to actually focus with any intensity. I think it’s the equivalent of having a professional athlete who’s coming to most games hungover. What’s one of the main reasons we spend so much time aimlessly surfing the Internet? Studies say it’s lack of sleep. Not getting enough reduces willpower and depletes the self-control you need to avoid bad habits like watching cat videos. Sleepiness slows down your thought processes. Scientists measuring sleepiness have found that sleep deprivation leads to lower alertness and concentration. It’s more difficult to focus and pay attention, so you’re more easily confused. This hampers your ability to perform tasks that require logical reasoning or complex thought. In his book The Brain’s Way of Healing, Norman Doidge explains that during sleep our sympathetic nervous system (our fight or flight reaction) is turned off, allowing for our parasympathetic system to turn on. When our parasympathetic system is turned on, a number of chemical reactions that promote growth and reenergize our neurons occur, leading to relaxation and preparing for the growth of new neural pathways and connections. Sleepiness also impairs judgment. Making decisions is more difficult because you can’t assess situations as well and pick the right behavior. Cain, S. (2012) Quiet: The Power of Introverts in a World That Can’t Stop Talking. Danvers, MA: Crown Publishing Group. Doidge, N. M.D. (2015) The Brain’s Way of Healing. New York, N.Y.:Viking. We know that every brain injury is different – which is why aspects of brain injury, such as prognosis and treatment, can be so complicated – if every brain injury is unique, how we find effective ways to treat each individual? Now, promising research suggests that a deeper understanding of interconnected brain networks may lead to personalized treatments for brain injury. 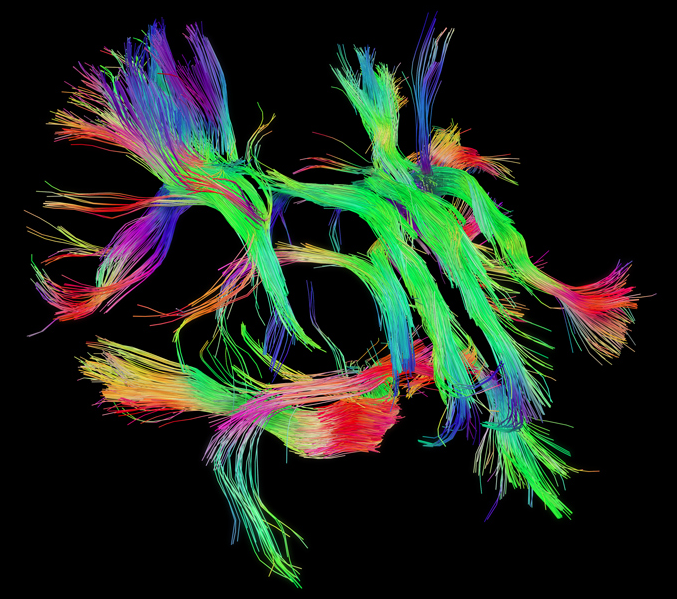 In a previous post, we discussed how a greater understanding of interconnected brain networks may one day be used as a diagnostic tool for brain injury. As discussed, these networks allow for communication across long distances in the brain. They enable us to direct our attention to important information in our internal and external environments, allowing us to plan and problem solve. The brain’s natural response to injury includes the activation of cell repair mechanisms to reduce edema (the build-up of fluid in the brain) and inflammation. 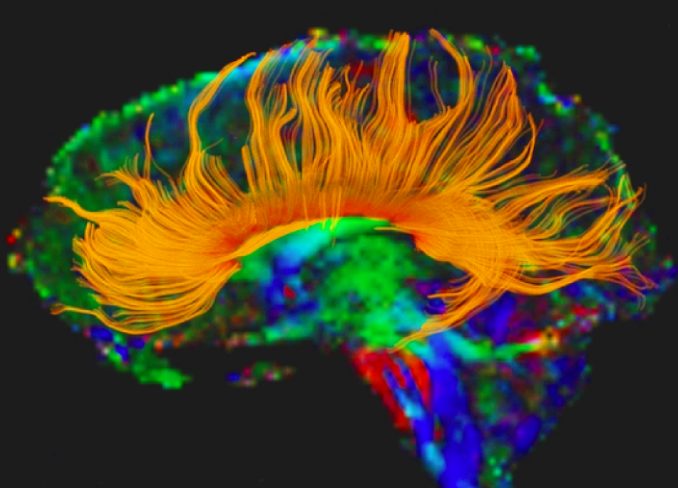 As the brain heals, it modifies previously existing intrinsic connectivity networks (ICN), forming new connections. Recent evidence from cognitive neuroscience suggests that noninvasive brain stimulation techniques help these networks recover following TBI. 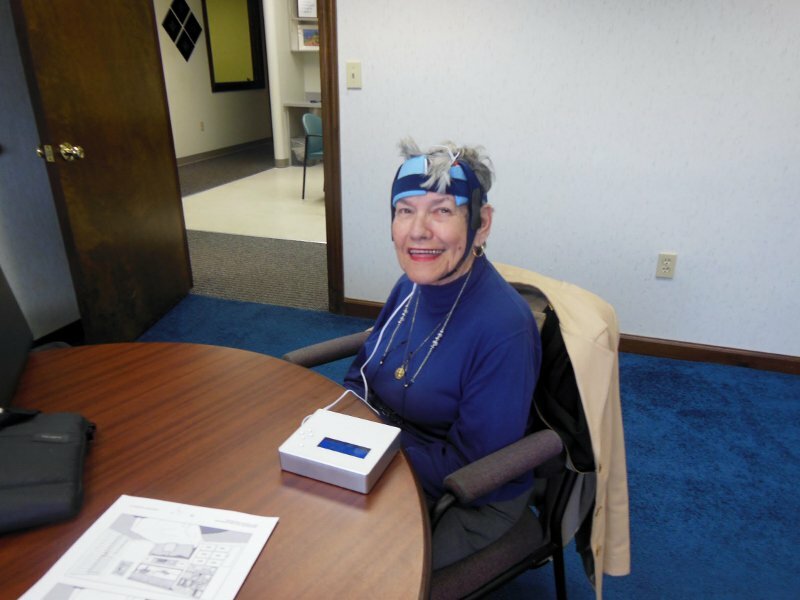 One of these techniques, transcranial direct-current brain stimulation (tDCS) involves the application of a weak electrical DC current to the scalp to control the excitability of ICNs. Research suggests this treatment helps the network regions prepare for, and respond optimally to, cognitive rehabilitation. Relatively brief periods of tDCS (30 min) have been found to enhance learning in a variety of perceptual, cognitive and motor tasks. 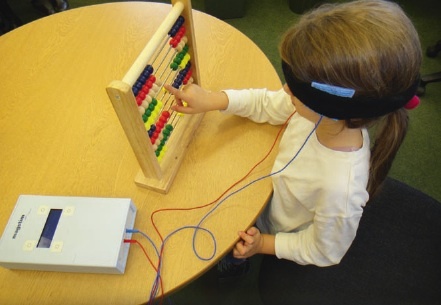 The research suggests that tDCS triggers learning by enhancing attention to critical stimuli and events within new tasks, helping patients learn new things faster and better. 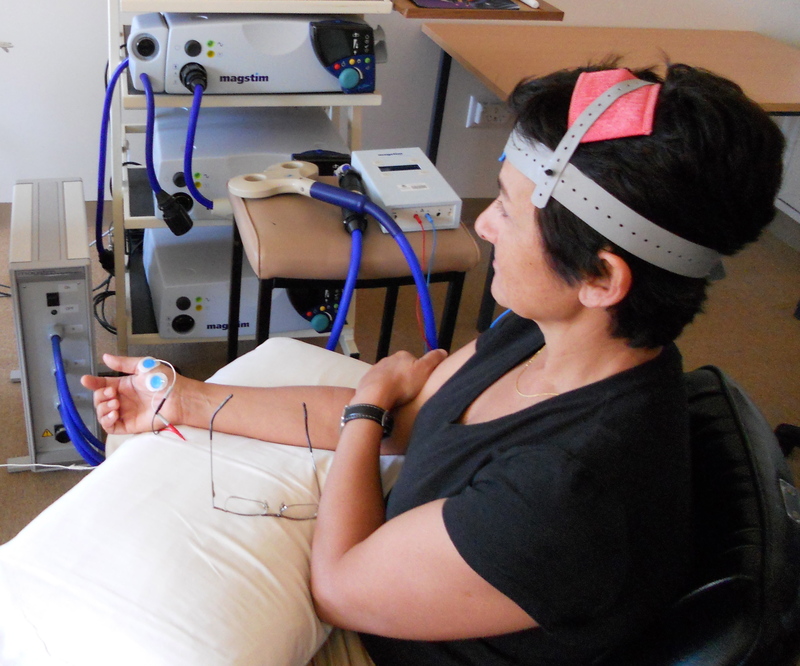 tDCS is usually well tolerated by patients, and is minimally invasive to the point that it does not interupt rehab activities, as the above picture demonstrates. 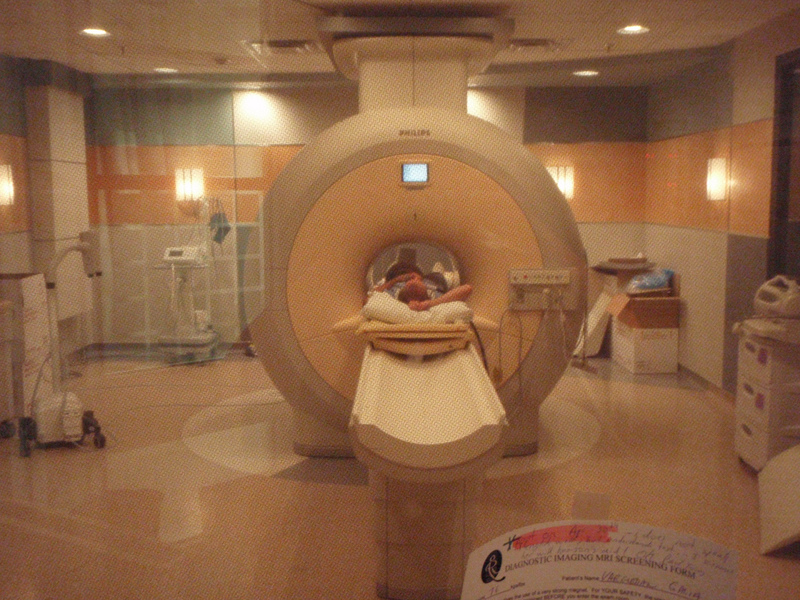 Currently, however, its potential in TBI treatment is limited by poor control over the location of the stimulation. New high definition t-DCS may be able to overcome this limitation, using specialized HD electrode arrays. 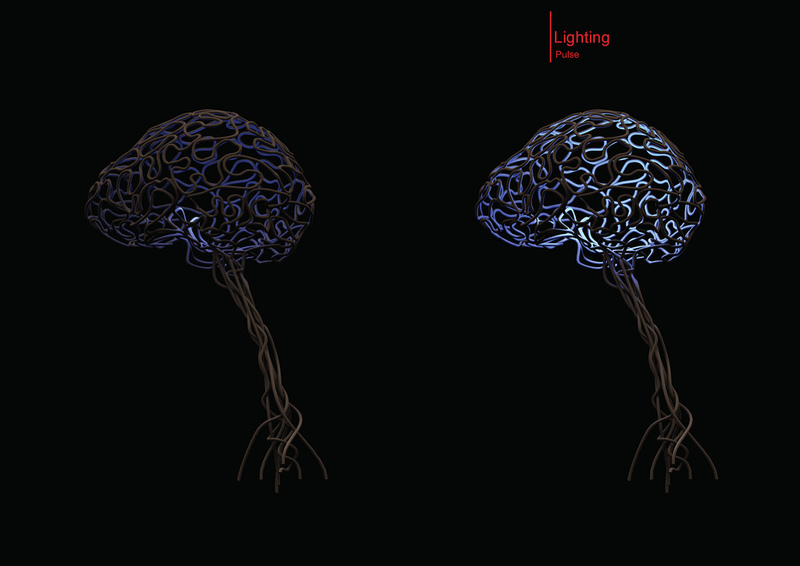 Modeling studies have shown that HD electrodes can generate a higher intensity on cortical targets as compared to conventional sponge electrodes. Once the precise target is established, computational models are used to maximize the intensity of the stimulation on a precise target. 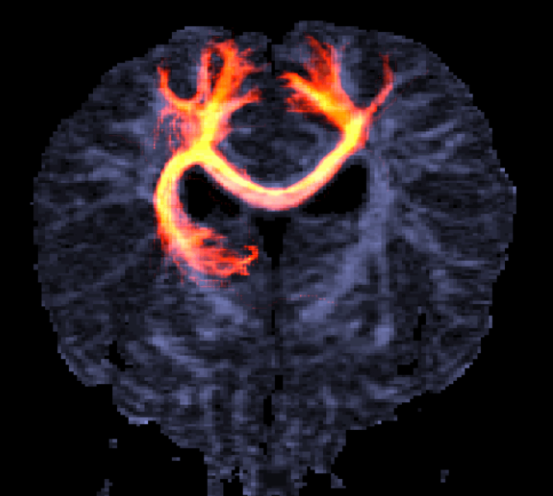 The benefit of maximizing intensity on a target, such as a damaged ICN, could lead to benefits such as increased attention span in people living with brain injury. The focus of current research is to identify the ICNs that are altered by TBI, and then to determine how these networks react to the HD-tDCS treatment. Eventually, this could lead to a personalized treatment approach for TBI that examines network diagnostics along with biomarkers of the traits (such as a person’s health status, nutrition, genetics, etc.) and states of the patient (such as their sleep quality and energy level) in an effort to optimize clinical therapy. Excerpted from Current Opinion in Behavioral Sciences 2015, 4:92–102 A themed issue on Cognitive enhancement, Edited by Barbara Sahakian and Arthur Kramer, 2015 Elsevier Ltd.
There’s more evidence that having a spouse, and being able to stick it out for the long-run in rehab, is good for you. Often, traumatic brain injury (TBI) results in a number of symptoms, problems, and complications. Among the most well-known of these are those which impair or compromise cognitive processes such as memory, attention, and thinking, and to a lesser extent, affective functions such as emotion and mood. But TBI can also have a negative impact on how a person engages in their community. Changes in community integration – meaning the extent to which one participates in their community, society, and home – have long been identified as a consequence of TBI. Given that higher levels of community integration following a TBI are positively related to life satisfaction, physical health and perceived success in transitioning from hospital to home, improving community integration should be a primary rehabilitation goal following brain injury. However, to improve community integration, it is first important to understand the factors that influence levels of community integration following TBI. One recent study did just this. In the study, the authors examined levels of community integration two-years following a brain injury. 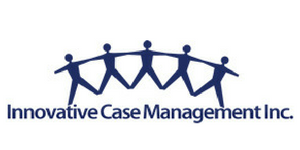 The study participants had either a moderate or a severe TBI. Although there are a number of ways to measure community integration, the authors of the study used the Community Integration Questionnaire (CIQ), a widely used and valid measure of community integration for patients with brain injury. Using this questionnaire was a strength of the study. 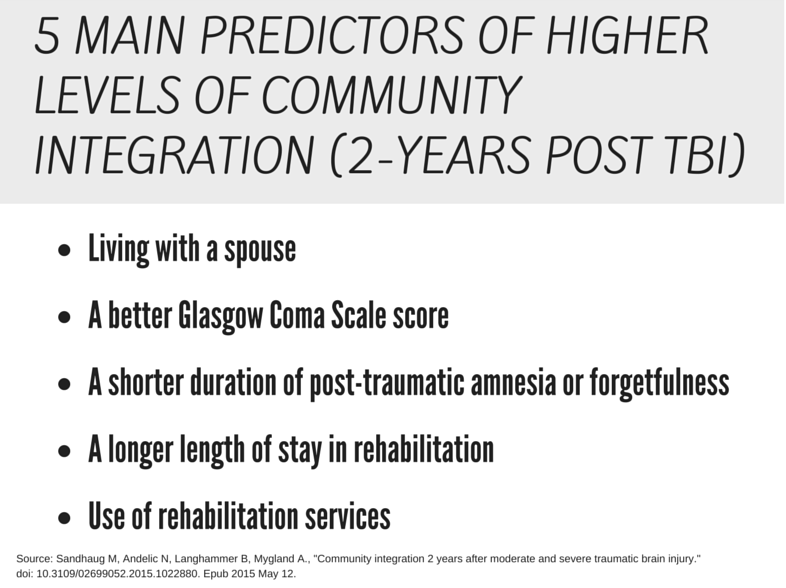 After a series of statistical analyses, the study identified five main predictors of higher levels of community integration two-years following a TBI. Promisingly, many factors can contribute positively to community integration. 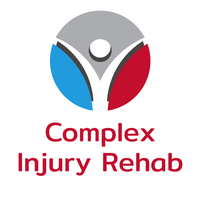 Certain family dynamics (such as living with a spouse) and accessing some healthcare services (i.e., rehabilitation programs) can improve community integration two-years following a brain injury. Importantly, this study indicates that there can be improvement in community integration and therefore recovery over time. 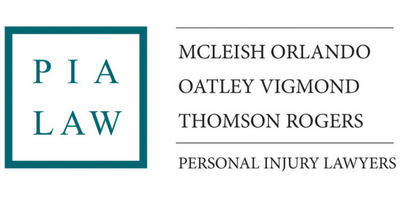 The results of this study can perhaps be used to ensure that TBI patients receive the supports they need to achieve a high level of community integration in the years following their injury.